IBF super-middleweight champion, James DeGale says he is pleading with advisor Al Haymon to set up a big money fight with WBC champion, Badou Jack after he dispatches Lucien Bute in Quebec on Saturday night. DeGale takes on a 35-year old Bute, who, along with long-sidelines through injury, is no longer considered to be the fighter and former champion he once was, especially since being dispatched in five ruthless rounds by Carl Froch in 2012, and while ‘Chunky’ says he isn’t overlooking his hometown opponent, he definitely has one eye on bigger fights. “Bute keeps going on about his home crowd and how he has never lost in Quebec City and it’s like he’s trying to get confidence. I’m easy, I’m going over there and I’m chilled,” DeGale told ESPN.com about Saturday’s fight. “The way I’m feeling, I’d say this fight will be over in six rounds but you never know. The Beijing ’08 gold medalist is keen to make 2016 ‘his year’ and at the top of his wish list is a fight with fellow Haymon man, and ‘Money Team’ fighter, Badou Jack, who last successfully defended his WBC trinket against DeGale’s bitter rival, George Groves back in September. 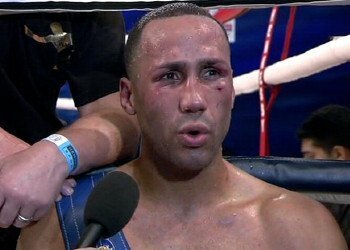 “I know British fans would travel to Las Vegas to see me fight over there and that’s what I’m really hoping for,” DeGale said. “One of my dreams is to see my name in lights in Las Vegas. “Badou Jack is based in Las Vegas, signed to Al Haymon and it would be so easy to make and we’d have the IBF and WBC belts on the line.